Born in The Netherlands, in Utrecht (my much beloved hometown) in 1956 as the youngest of five children in a middle-class family of Protestant persuasion. As a child, I was fascinated by the differences among plants and animals. I enjoyed tinkering and experimenting. In 1973 I began studying biology, first at the University of Utrecht, and later at the University of Leiden. Bachelor’s in ecology and Master’s in ecology, environmental science, and teaching qualification. Developed an eye for detail, as studying biology is one great exercise in observation. Graduated in 1980 and then dedicated myself to administering learning processes and developing curricula in various educational institutions (taught biology in LBO (Dutch lower vocational school) and MAVO (Dutch lower general secondary school)). Over time, learned a great deal about dealing with people and careful organisation and direction of lessons. Between 1985 and 1988, became the proud mother of three children. I actually wanted to be a researcher. But in 1980, the environment was not in vogue and almost no one would pay you to do ecological research. What captivated me the most at the school where I taught was the atmosphere of fellowship. Practical people, with a passion for their work. In 1981, I also held a temporary six-month position as a scientific researcher at Staatsbosbeheer (Dutch Forestry Commission). As a field biologist, wading with boots through the mud along the streams of South Limburg Province, to study the impact of fertilization (yes, even back then) on species of rare riverbank vegetation higher up on the slopes. After ten years of education, I was beginning to get a feel for teaching, but I wanted more. In 1990, became a consultant at DvL, a regional firm of consulting engineers. Consulting municipal authorities on environmental matters, such as granting of permits and law enforcement. After that, consultant at world’s largest inspection firm, SGS. From 1995 to 2002 at VB/ Deloitte & Touche. Started off as environmental expert and via environmental and quality management auditor developed into organisational consultant for processes. Projects which I helped start as an organisational consultant were enacted at governmental environment ministries. Introduction of quality management, research into the development and maintenance of environmental legislation. At that time, also conducted research into practical experiences of SMEs with environmental laws. This resulted in the first major rift in my scientific approach and attitude. Although I did already have some doubts (how often were hypotheses adjusted post hoc in order to make them fit observations?). How does it end up that the elegantly devised, solidly constructed rules or management systems often work so poorly in practice? This prompted my decision, after requesting the brochure three years in a row, to begin the Masters program in Change Management at Sioo. I see it as a challenge to find balance between my immediate family, work, relatives, friends, and hobbies. The experiences that Charles Handy describes in his book “The elephant and the flea” resonate with me. I enjoy being that self-willed, creative freelancer, who strives to develop things that make a difference: writing, contributing something, helping to develop capacities, creating something new by bringing different disciplines together (such as ecology, didactics, systems thinking, and learning processes in organisations). I now understand why this development is often so difficult, and finally I have become a researcher of ecology. 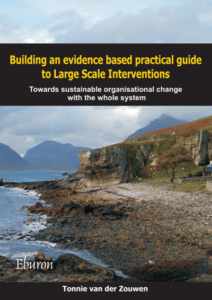 The system under study changed from natural to work systems, but using the principles of naturalistic inquiry I recognize many similarities between ecological and organisational studies.